The Trainer 15 features a large uninhibited area that is perfect for family fun and exercise. 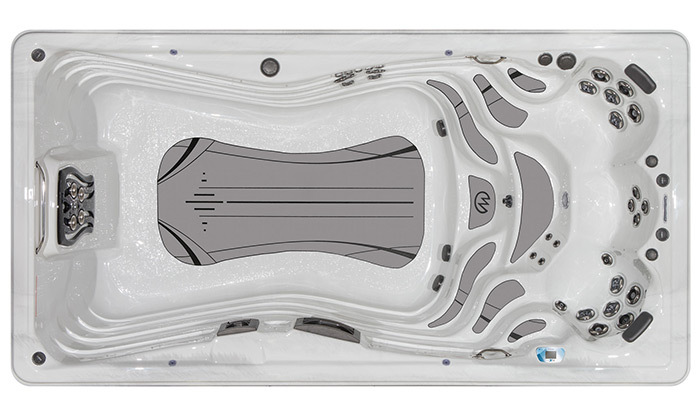 The VIP (Velocity Injector Plate) Technology enhances the swim jet performance to an impressive 45% over a standard swim spa. Plus, when it comes to hydrotherapy, rehabilitation, and relaxation, nothing compares to the Xtreme Therapy Seat and Xtreme Therapy Cove. Dimensions: 180" x 94" x 51"
Weight (dry/full): 2,310 lbs. / 16,565 lbs.